Missing the medieval lanes of many other Italian cities, Milan's more modern style is a reflection of the city's undisputed role as the commercial capital of Italy. Bankers, designers, and fashionistas head to Milan for both work and play. From chunky layered looks to ward off the chill blowing from the Alps to tailored 3-piece suits for a busy day at work, the Milanese take their sartorial choices seriously. 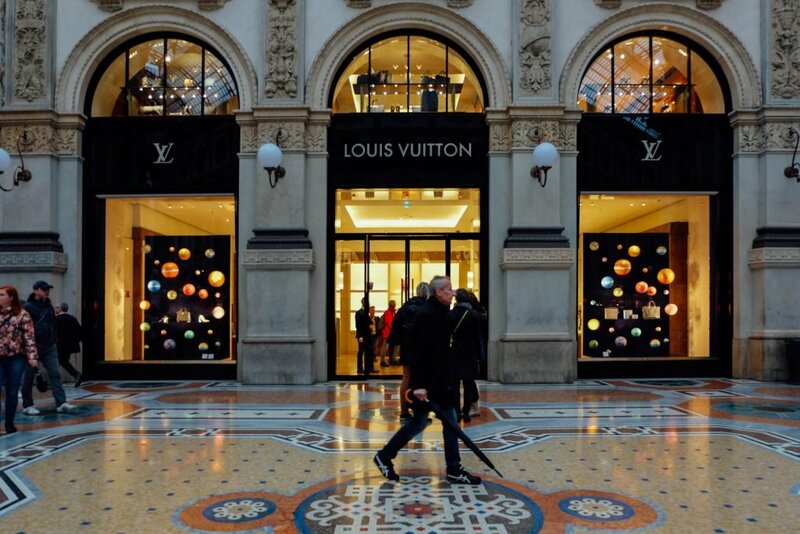 When it comes to shopping, Milan means business. The city centre is a fashion mecca - home to flagship stores from the likes of Prada and Armani, as well as the headquarters of Italian luxury brands such as Valentino, Versace, and Dolce & Gabbana. Want to experience some of the irresistible retailing? 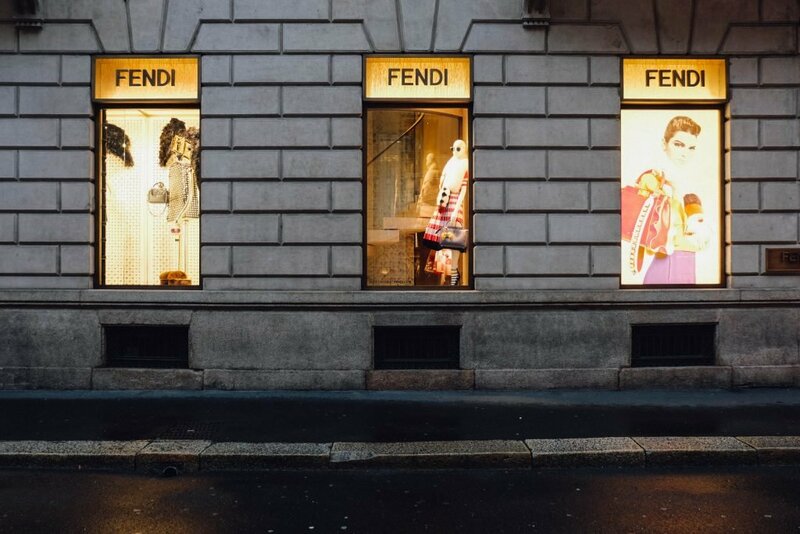 Follow this Milan shopping guide to fashion-forward nirvana! 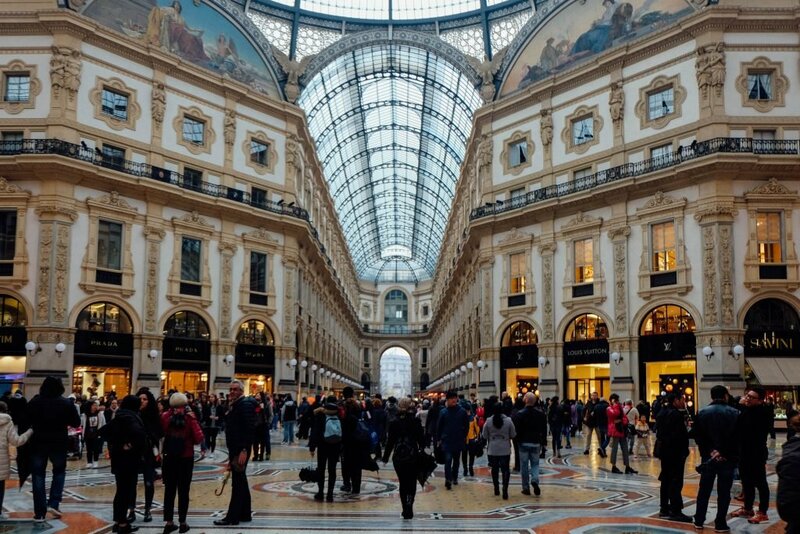 Named for the first king of Italy, the Galleria is one of the world's oldest shopping malls. Designed in 1861 and opening in 1867, the soaring 4-story arcade makes the shopping centre an architectural gem in addition to a major luxury brand destination. 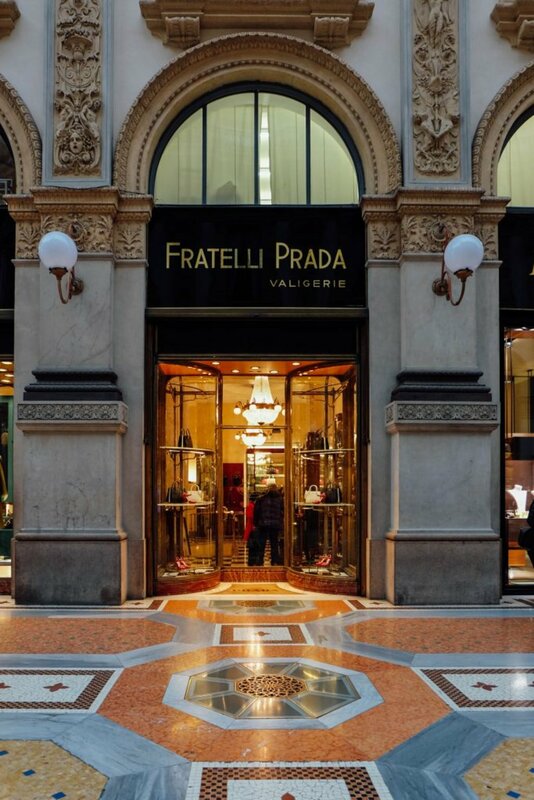 The very first Prada store opened its doors in the Galleria in 1913. Now redesigned into a major flagship store, you can stop for a coffee in the classic Marchesi cafe on the second floor. The caffeine buzz will keep you moving on to the Quadrilatero d'Oro. The Quadrilatero d'Oro della moda is the 'golden square of fashion' - the heart of Milan's fashion district. The square is formed by Via Monte Napoleone, Via Manzoni, Via della Spiga, and Corso Venezia. Less tourist-y than the Galleria, the quadrilatero area draws big spenders and window shoppers. Via Monte Napoleone is particularly (in)famous for being one of the most expensive shopping streets in the world. It's retail prestige dates back to the 1950s, and the chic street is lined with the likes of Fendi and Chanel. The eye-catching window displays are worth a pilgrimage, even if the price tags remain aspirational. While Milan is known fancy designer duds, there is no shame in seeking out the High Street version of the haute couture looks. A few steps from the exclusive shops of the Galleria, Via Torino offers more accessible shopping options with Zara and Pimkie giving way to smaller shoe stores and jewelery boutiques as the street curves down towards the Navigli (canal) area. Another Milanese high street is Corso Buenos Aires. Rumours swirl that Corso Buenos Aires may be the longest shopping street in Europe. 350 shops are spread out over more than a kilometre, meaning you should set out with plenty of time if you intend to undertake a spree of affordable proportions at the likes of H&M and Benetton. For more bohemia vibes, beeline straight the Brera. The cool neighborhood north of the Duomo is a paradise of boutiques and galleries on quiet cobblestone streets. Stop by Spelta (Via Solferino 1) for handmade shoes at a reasonable price, or pop into Arform (Via della Moscova 22) for classic home accessories. In addition to one-of-a-kind shops, Brera is home to some of the best open-air markets, such as the morning market that sets up stalls on Via San Marco on Monday and Thursday. Looking for designer style without the gut-wrenching price tag? Milan is dotted with outlets for budget shopping options. The best loved is 10 Corso Como Outlet (Via Tazzoli 3), the budget-shopper's version of famed concept store of the same name. Luxe brand names of intermixed with vintage gems, just 5 minutes away from the shop's original location. Shabby chic racks of Chloe and Helmut Lang will keep retail lovers searching through the bazaar-like outpost for hours. Also in the heart of Milan is Il Salvagente (Via Fratelli Bronzetti, 16) - an outlet store that was been a staple in the city since 1978. Accessories, shoes and clothing from high-end designers can be found at up to 70% off if you have a sharp eye and a little patience. The very best time to visit Milan? Well, during Fashion Week if you want to see the edgy outfits and get a taste of the next season. However, diehard shopaholics should plan to be in town in late July and January - when the Italian sales begin and amazing deals can be found in all of Milan's shopping destinations.